I decided to do a little world building for a story/world-building project/comic I'm doing and give my Dwarves their own language (for fun and for visual appeal)! It's not exactly fully formed, but it's coming along. Mostly I've just reverse-romanized phrases from English into Dwarvish. I think it looks pretty visually interesting (and indicative of their pragmatic, workmanlike, and long-suffering cultural identity) and is at least functional for translating English into cryptic messages with which to emblazon things in my future drawings. I've tried to make it sound very harsh and somewhat guttural--which, again, I THINK I've achieved. Honestly though, I don't know the first thing about constructing languages other than a cursory google search to get started. I was A.) Hoping Bay12ers might have some advice/criticism/input for this language to really perfect it and B.) share some conlangs or their own, or get started on one. 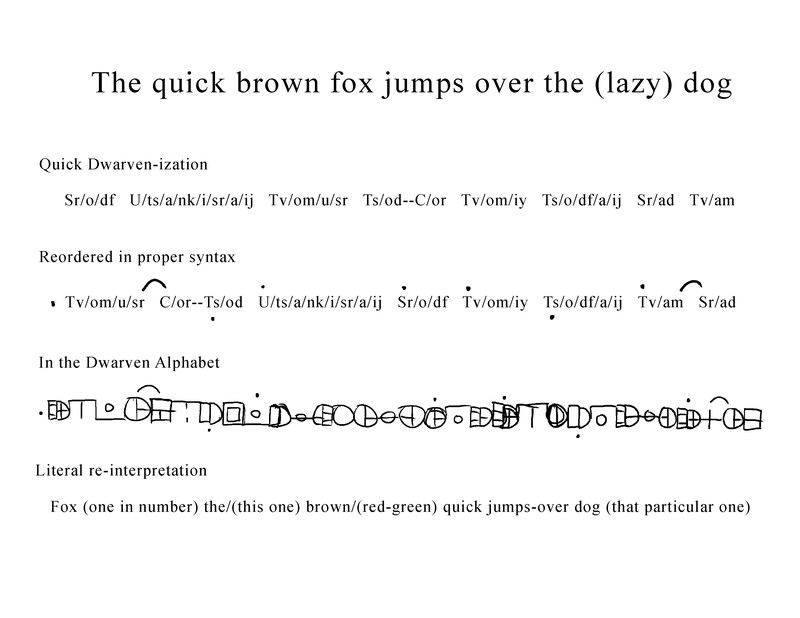 EDIT: There is one "rule" not specified in this prototype document, in that, like cursive, the runes should be connected in someway. Generally speaking from the highest to the next-lowest point, and again if there are any free-hanging symbols left unattached. P.S. Elvish possibly incoming after Dwarvish (Dravwïsh[a]) is finished. I'm having a lot of trouble understanding the document. Essentially, on the left is the "alphabet" which in this case, is simply a collection of sounds/vocalizations and their corresponding runes. On the right is a translation from English -> "Dwarf Sounds" -> Phonetic Pronunciation -> Dwarven Runes. EDIT: It's also quite messy, for which I apologize. For any conlang project, the Language Construction Kit resource is the go-to for beginners. And if you want some in-depth examples, Ardalambion has information on Tolkien's Middle-earth languages. From your document, I'd say you're jumping into this from the wrong side: focusing on the alphabet/writing system rather than the language itself. I echo Parsley's sentiments, and not just because the writing is messy, but because there appears to be no sequence or logic to the glyphs or the sounds they represent. Also the translation is unhelpful, because I don't know what meaning each sound corresponds to. For a "harsh and guttural" sound I'd use mainly stop/plosive consonants (like /p/, /t/, /g/, etc.) and velar/laryngeal consonants (/k/, /g/, /h/, /ŋ/ and so on), supplemented by bilabials (/p/, /f/ (sort of), /m/) and nasals (/m/, /n/, /ŋ/), and with as few alveolars (/t/, /n/, /s/) and approximants (/r/, /l/, /w/, /j/) as possible. The first tend to sound harsher (at least to English speakers) while the last sound clearer and smoother. 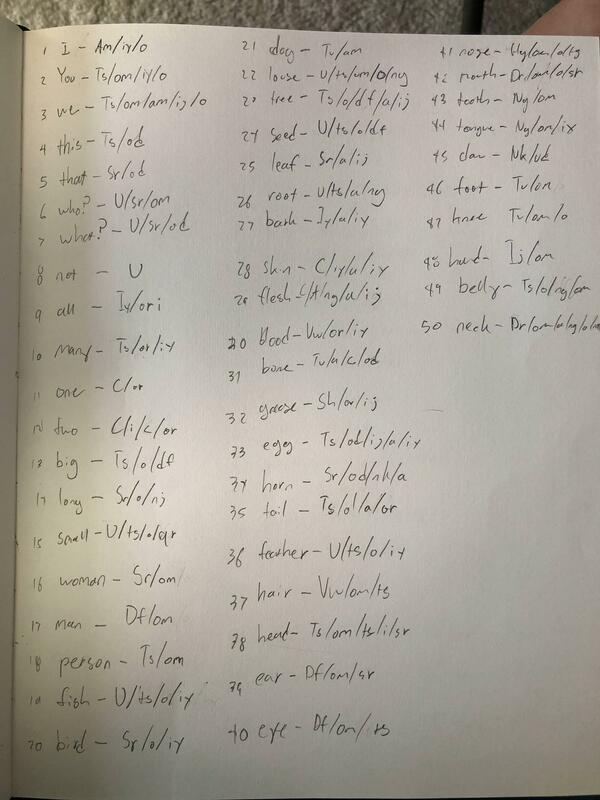 Note that you can have as many sounds as you want, but in any given sentence stops and velars should dominate. Affricates, like /ʧ/ (English "sh") or /ʤ/ ("j") are also good, because they've got consonants in them. For vowels I'd tend toward extremes--very open (like /a/ ~ /ɑ/), very front/close (like /i/ or /y/) and very back/close (/u/ or /ɯ/). Once you've got a basic set of sounds, you want words. As I said, you can just cipher from an English dictionary if you like, but that will almost necessitate replicating English grammar--the concept of a "word" is a fraught one, and not all languages see them the same way. Instead you may want to think of them as "roots": basic units of meaning without reference to "part of speech". Point is, associate some group or sequence of phonemes with a particular meaning. To keep with a harsh-sounding language, I'd use lots of consonants and consonant clusters with fewer vowels--you may even want to use some syllabic consonants. Once you're happy with your words/roots, now comes the grammar. Again, you can use English grammar as a basis, but the possibilities here are really endless. If you're familiar with any other languages (especially non-Indo-European languages) you can appreciate how diverse grammars can be; and in any case a lot of linguistic research on syntax and morphology will help you to understand a lot more about how language "works," and thus to create a language that feels and sounds more real and alive. And only after you've done all that, create the writing system. 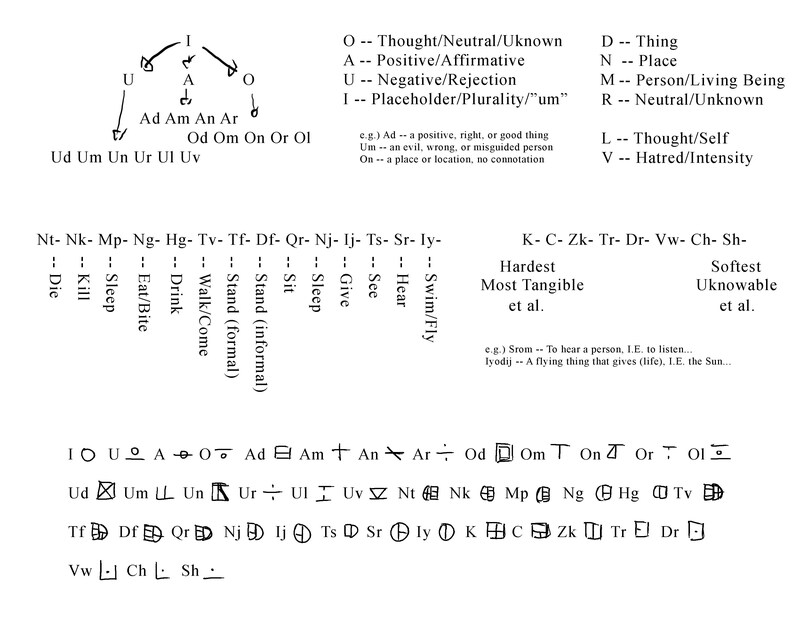 And there's more than just alphabets: there's also abudigas, abjads, syllabaries, logograms, etc. Sorry if this is all too much information; I can go through it piece by piece if you have questions (although the Kit linked above probably will answer you better than I can). Alternatively, sorry if you know all this already--I don't know how much you know, so I just tried to give a basic run-through. I don't have much time to type, but my short-version feelings are that it's quite nice and gets across the guttural sound. To the end of making it more distinct and adding to that feeling, it might be worth eliminating the pure vowels in order to keep a japanese-esque set of phonemes, where all vowels are found in vowel-consonant pairings. Are vowels long or short, or both, and how is that indicated. Are there any aspirated consonants, palatal vowels etc? Is there any gendering and if so, is there a regular gender-suffix/affix? I'm a bit of a linguistics geek (can't speak any other languages, but I like learning about them), so I'd like to see some extra depth added here. If you're just ciphering English, I guess that's fine as well. EDIT: What Loam said, but they've clearly got a little bit more time than I do, so Loam's answer is better and more full. Okay, take #2: I am sure it is still horribly "wrong" and frankly the IPA is... quite confusing. At least in trying to associate the symbols with the sounds. EDIT: Still working at it ofc. EDIT: WARNING: No IPA stuff to actually dictate the definite sounds of phonemes. My apologies. Basically sound allocation is based on associating tangible and intense concepts/things with harder sounds and more nebulous or dull ones with softer sounds. There is some cultural meaning to each sound which also changes contextually and can be used to define concepts and words that aren't loan words--they're meaning is both literal and figurative. *below for some examples of phonotactics and word construction. EDIT: I/U/A/O also mean (plural, placeholder vowel, uncertainty, and mistakes in speech), NOT doing something/NOT to/NOT to do/Can't, doing something/to/to do, and to be/is--respectively. Loose and fast and not at all complete, but it can form a kind of functioning sentence. The super-dots indicate new words, usually verbs and adjectives, the sub-dots indicate connected or hyphenated words which modify the first word in the chain, the super-arcs are a kind of nesting to let the reader know the rest of the sentence after the mark has to do with the marked word, I've yet to invent some kind of comma or other method of getting out of the nest without starting a new sentence. *Also my apologies, the translation is a little strange... and contextual. And also missing "lazy", whoops. But I guess it's a step in the right direction??? I may have mentioned it already, but I forgot to translate "lazy", I'm sure there are other problems with it. AND the runes are placeholders. Again, it's spotty, incomplete, and not yet fully explored--but I think it is more versatile and not dependent and transcription like before. Also, I'm just kind of feeling around blindly here. The roots of words are ill-defined and very malleable. As are the literal meaning of the words themselves. Sorry for taking so long to get back to this (if you're even still working on it!) but I'll try to give some advice. I guess my overall impression is that it's too systematic. I don't know every language in the world, but I'm guessing none of them assigns meaning on the purely phonetic level (i.e. each "sound" has its own meaning). 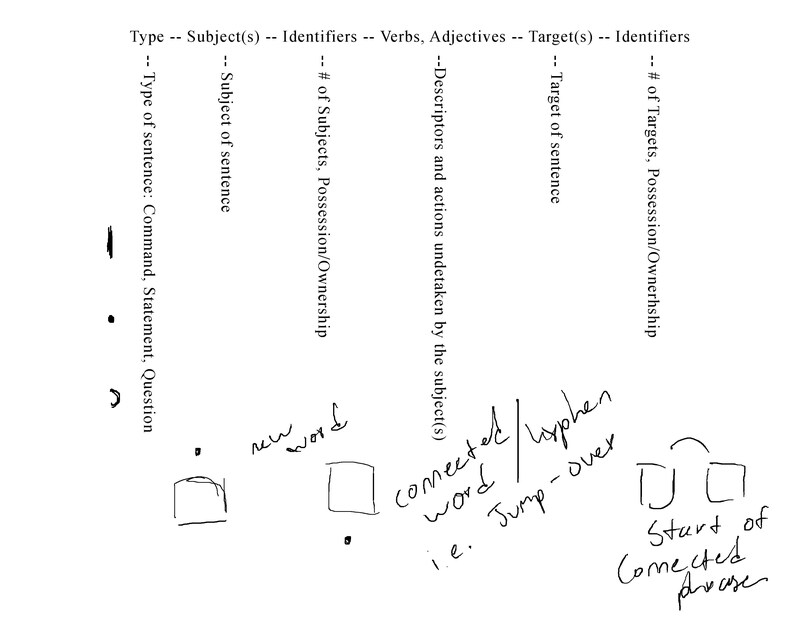 Morphemes -- units of meaning, including words, affixes, case endings, etc. -- tend to at least be whole syllables, with meaning assigned arbitrarily. For example, take the word "tree" in English. Only the whole syllable -- [tri] in IPA -- has meaning; each individual phoneme -- /t/, /r/, /i/ -- has no meaning in and of itself. [tri] simply means "tree," and that's the end of it. those use the same structures? -a similar problem afflicts me with "woman" and "person": Sr/om, Ts/om. Where do the "hear" and "see" roots come into these meanings? so the translation should be "big thing that gives good." But you see, that depends on me knowing "big," and being able to distinguish that from any other combination of those phonemes. And so on. I could probably write a little blurb for each entry. I'm sorry if that sounds harsh -- it's not meant to discourage you, just to give you a heads-up that if you boil your language down too much it might turn into alphabet soup! THAT SAID: I think you're onto something, in terms of constructing words from concatenating short, basic roots. You might want to check out some Native American languages, which I believe do a lot of that kind of word-formation. I would only caution you to have more morphemes, many more. Right now you have 32. I don't think that's enough to make a viable language. I would say, as a start, go through that whole dictionary and create a unique syllable for each entry; let those be the roots that you build the rest of your words from, not the phonemes themselves. Even those 100 words probably won't be enough, but it's better than 32. But that's just me. It's your language, you decide how you want it to sound and work. After all, maybe dwarves are more capable of understanding such a language than humans. PS: In hindsight I shouldn't have sent you straight to the IPA page for your phonology introduction. I ought to have sent you to the phonology of English page, since I myself learned about IPA from learning English phonology. You'll probably find this much easier to make sense of than jumping into the whole thing at once. No problem! Thanks for offering criticism--honestly, I too have been just digesting this system of construction. As you say, it is too narrow and specific to really create enough, it is very much over-repetitious. Although creating this language is very much about aesthetics, I'd very much like it to be at least partially functional. 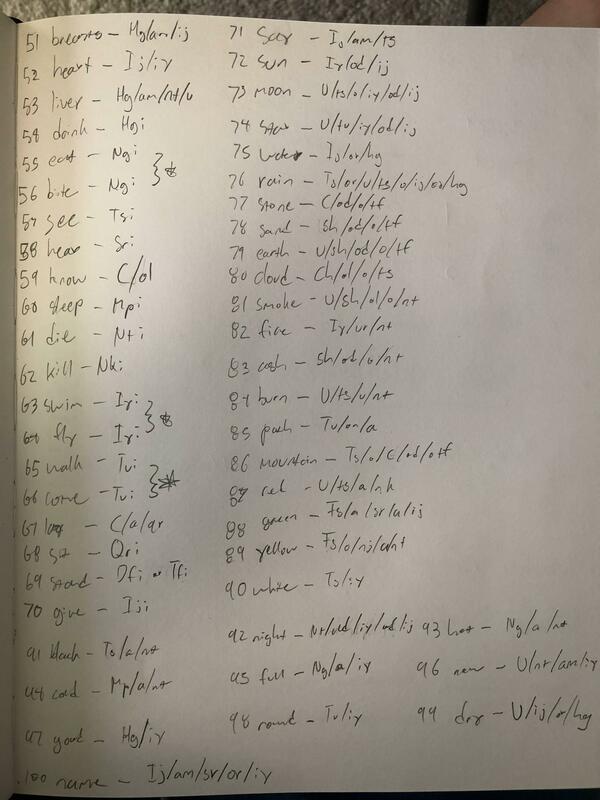 It's my belief that 95% of a story is in the world building you don't get to see, and honestly, to be able to have an explorer see some runes, and poorly translate them (myself knowing the actual translation, and some common pitfalls in translating a foreign language)--to be able to express that when I know 100% of the process makes things more personal and believable. Strings of small moments like those, where the narrative and the character comes out naturally because you've spent so much time on the creating this world, are really what create great works. Additionally, the language--stunted as it is--has not come out sounding how I wished it to sound originally. I've actually revised the word construction a bit, to moderate effect, but the words jsut don't have that oomph to them. Even when practiced, there tends to too many consonants. And yes, thank you for the English Phonology link. IPA is just a lot to learn all at once. As for my plan of action... I guess I will go back to the drawing board in a sense. Perhaps I will keep this attempt archived as an ACTUAL failed attempt to create a Dwarven language. It would make sense in the history of my world, where beings of different races are originally different-but-connected facets of the same god, but are eventually given cognizance and separated--such a happening would necessitate the eventual development of a functional language. I agree about the world-building, especially when language is concerned. I (jokingly) think linguistics has ruined fantasy for me: now when I see a bunch of made-up words or names with no history behind them, I groan. It's the attention to detail that makes a world feel believable, which is one reason why Middle-earth is so compelling. On the other hand, if you're like me and can't be satisfied unless your world has not only a language, but a whole family of languages derived from a proto-language through regular and believable phonetic and semantic changes... well, you end up never getting around to world-building at all! Haha, what do they say? That you can tell the quality of a fantasy novel by how many made up words it uses? It really doesn't matter whether it's language, or what someone is wearing, or how someplace looks--most of the time you can just TELL when someone hasn't put the work in, even when you don't know enough to point it out specifically, people usually have a gut feeling about it all. I probably won't go too in depth into other languages. My goal setting out has been to create a world in which a lot of interesting stories about Dwarves (I have always been absolutely fascinated with Dwarves, even before my love of DF, but they've just never gotten the epic story/history they deserve [to my knowledge]. Markus Heitz' The Dwarves comes close, but... it's just missing something. LOTR is obviously where my love of Dwarves stemmed from, but so much of the Dwarves had gone unwritten about and unportrayed--The Hobbit doing a real slapstick and mediocre job. Warhammer and DnD Dwarves borrow too heavily from LOTR without creating enough new ideas.) Without getting too terribly in depth about the history and ideas behind it all, Elvish is a dead language, and the language(s) of humans will just be represented by English. Goblin-tongue might get some work, as they are extensively involved in the latter part of the history of my world, and mingle with demons--who may have their own tongue as well, but just as likely have many non-verbal ways to communicate. Other than that, while Gods/godhood/godliness play a large role either directly or thematically in my story, there are simply too many and they are too ethereal to develop language(s) for. And there's really no reason for them to not be able to communicate in the tongues of the mortal races. ACTUALLY, I planned/plan on turning this thread into a general world building thread for my world. I'm planning to write some poetry or tall tales about the myths of the world to perhaps propel myself into the later ages. Decided the other day to take a swing at writing the first part of an epic poem to get the feel for the history of my world. It's supposed to be in iambic pentameter, but--well it's a bit mutilated in form methinks. which is most fair, the font of life most fleeting. everlasting life. Which henceforth we’ll call, Gods. gifts upon a lifeless curtain, dual. with rage, impotent and icy. this turn sprung it’s fount, no mortal man can say. of stone and wood and river a-running. plane the warring three soon made their ghastly homes. the war of gods—upon the land, a blight. Figured I would post something just to keep up with myself. Criticism and comments very much welcome. There are another four parts (The course of the war, the victory of Elvenkind over the gods, the creation of mortal life, and the extinction of the Elves) detailing the myths leading to the first age of recorded history. As an added benefit, it'll pretty much lay out how magic works in my world, so yay. 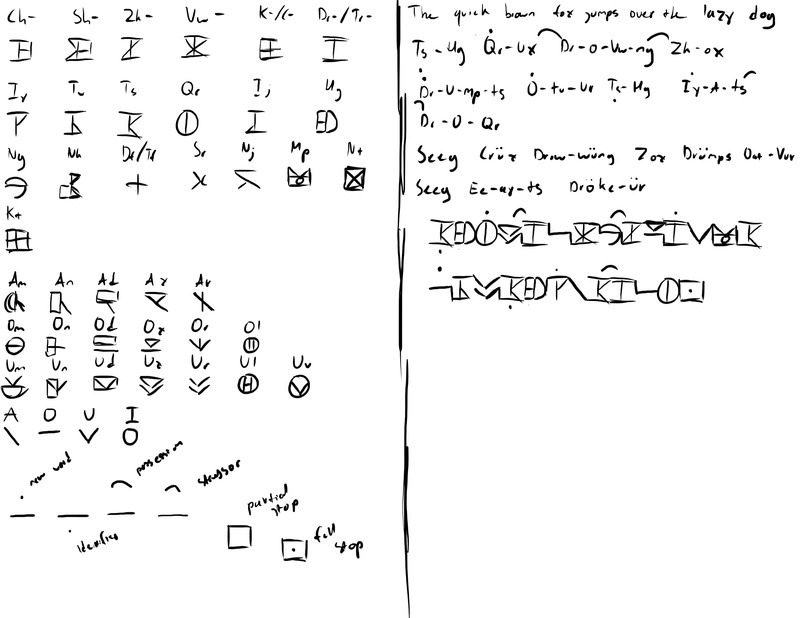 Today, I go back to working on Dwarven Language 2.0--and I will definitely post some results later. and turn them to a gilded generation, far removed from the horrors of our past and the betrayals of our future. Rejoice. In the world of Ash (working title), there are three major schools of magic. The most powerful among them being Fate. It is probably better to describe Fate (and the other "schools") as more a broad definition of the possible manifestations of magic or otherworldly powers rather than any sort of studied, well-examined, or scientific topic. With that in mind, let's talk about what ALL magic is and is not in Ash. First of all, no magic can be "seen", and precious little can be heard or otherwise be picked up by the natural senses of living creatures--at most, the most powerful magic-users or people otherwise sensitive to magic can sometimes "feel" its use. There are no defined spells per say--indeed, all magic is a dangerous and uncertain bargain struck with unknown powers. (Not the Gods, who are themselves great magic users, but not the source of it) But it could be true that certain phrases or actions uttered and performed as to extract a specific feeling may produce the same magical effect regularly--though the results would differ between individuals. Fate specifically is the most nebulous of magic. Whilst most magic can have some tangible effect on the world, it is impossible to know if something has been fated to happen or has happened by chance. At the dawn of the First Age, the world was sealed off from the influence of the Gods, Man was cursed with Fate, each human's life bound to a moment of triumph followed by inevitable decline. But while both Men and Dwarves were cursed with mortality, the Dwarves escaped the curse of Fate by hiding themselves in secret places beneath the world. The Elves were cursed only with the separation of the minds, and viewed it as more of a blessing than a curse, but their meddling in the natural order of things, and use of Fate to affect change doomed their race to destruction. Those who do manage to invoke the powers of Fate are often able to achieve otherwise impossible things at great cost to themselves. It is said that all the greatest kings of Men have known how to and regularly evoke Fate. It can be unclear how Fate is actually used, while it is said that all Men are more fateful, for any individual the effect is variable. What is certain is the price--for temporary, short term, or present victory, even greater disaster is wrought in the future. For most, a man or woman's fate dies with them--but in truly incredible circumstances, the ill effect of a lucky turn of events can leave it's mark on friends, family, and those physically closest to the fated. The effect works both ways, as the ebbing and tiding of Fate is unnatural and will always seek to return to a modest equilibrium. To visit great disaster on someone or something is to later reward them handsomely. It becomes more convoluted the more people are involved--with such schemes as to trade one great achievement for many smaller failings among a crowd. It does not always work so, sometimes leaving a lasting effect on a person, prolonging their life, or simply killing them and any number of others. Fate is unpredictable. Luckily, knowledge of the literal magic known as Fate is not common, and even less are methods for calling upon it. "Thou" is 2nd pers. sing. only (cognate with Latin tu, German du, Russian ty, etc.). "You" is normally 2nd pers. plural, but can also function as a polite/formal address to an individual. Contrary to popular belief "thou" is not the "formal" word, but the informal/familiar -- we only think it's formal because we only hear it in "formal" situations, like Shakespeare plays. "Thee" is the oblique case of "thou" -- use it only where you would use "me," and use "thou" only where you would use "I." You can similarly use "ye" as an oblique of "you," but it's not necessary: you can just use "you" as in contemporary English. The genitive case of "thou" is "thine"; this is used just like "mine" in contemporary English, as a standalone pronoun after a linking verb: "this book is mine / thine." "Thy" is used like "my," as an adjective attached to a noun: "my book / thy book." But before vowels "thy/my" can become "thine/mine": mine eyes / thine eyes." Think of the difference between a and an. "You/yours/your" are just as in contemporary English: "you" is nominative/oblique, "yours" is genitive (the book is yours), and "your" is an adjective (your book). As for the magic stuff: it sounds pretty neat so far, although it's hard to comment on someone else's worldbuilding without knowing the whole metaphysics behind it all. I'll only say for the moment that you might avoid using the terms "schools" (and maybe even "magic"), as it seems you're describing something much more fluid and hard-to-categorize. Which is good IMO: I like my magic mysterious and unexplained, rather than extensively categorized like a science. But that's me. On the poem: well, you obviously know the scansion needs work. The best way to learn iambic pentameter in my experience is to read and watch a lot of Shakespeare. After a while it just comes naturally. Also, as an aside, the "typical" English epic verse uses couplets throughout -- but that is far from a hard-and-fast rule, since there isn't a lot of English epic verse. But Chaucer uses couplets in Canterbury Tales, Dryden used them in his Aeneid translation, and Tolkien in his Lay of Luthien, so there's some precedent for it. Something to consider. Thanks for the clarification on "thine", I will revise. As for the magic... it is indeed magic. It's more than just divine intention or random manifestations of the will. As for calling them schools... I just don't know what else to call a somewhat-defined large sub-division of the overall magic of a universe. It's related to but is not the metaphysics of the universe. The Gods are theoretically omnipotent and held at bay by some other undefined magical resource. That said, it is the Gods who first used magic and passed it down to the mortals (through less than admirable means, but still) so it is indeed something of a learnable skill. That said, Fate is just tough to explain. The other two "schools" of magic are less ill-defined. On the Poem: I dunno how I feel about lots of couplets, honestly I am less inclined to rhyme than simply to include consonance.